... The less effort, more relaxed you are, and more subtle you surf it the better it responds. It forces you to strip down any superfluous movement and really focus on the wave. You can still throw in some Dionysian hand jive . Surely. A subtle nose blow or wrist adjustment on the wettie is statement enough. You have to surf to feel the ocean. Sometimes the ocean catches you, Wipeout! Ok. So it’s been about 9 months since I got my custom 6’4 single off Stuart Paterson. Have surfed it in a mix of conditions. Ideal being chest high to double overhead. And of course being a single fin, it wants a running wall with a consistent pocket. It eats points and reefs and quality walled up beach breaks. Pretty flat rocker so has a tonne of glide speed. It’ll take on a steep drop, but you’ve gotta get in early, be on point with positioning and get your line set right. Hollower and faster the wave, the steadier it feels and the better it goes. Forget trying to surf vert-top-to-bottom on it, not going to happen. But it will turn in procession, high and tight off the top, and steep in the bowl, providing you’ve kept tight in the pocket and bottom turned deep in the trough, delaying your turns. Have had a few barrels on it so far and the board feels amazing. It holds in beautifully, without thought, and milks the trimline for speed. Cutbacks feel clean and like a fine scalpel. The board demands precision. If your timing is out it’s very unforgiving. It’ll lose momentum - no “quick pumps” to regain speed. It sharpens your game. 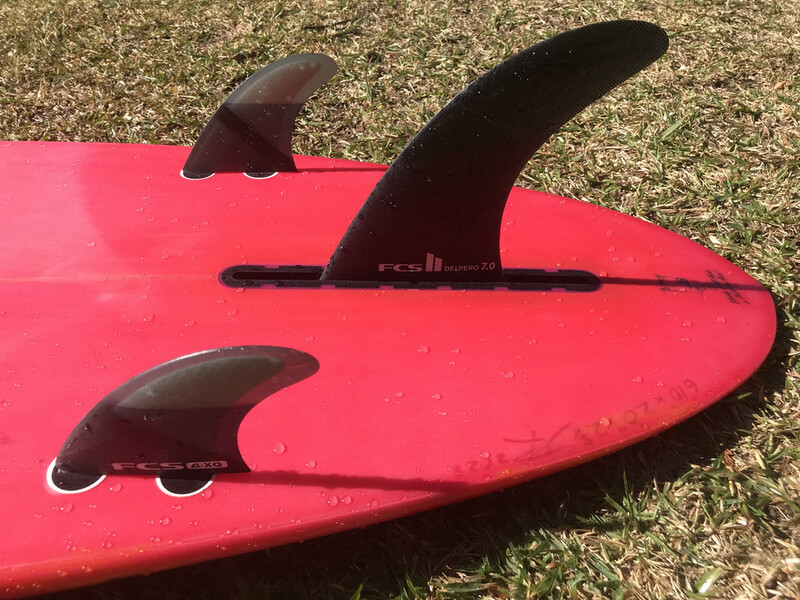 It’s my board of choice for sandon, cronulla point, and reefs down south. First photo I thought Iggy has added some cuff restraints to his dungeon. Then I realized it was a surf shop and they were leg ropes hanging over the back. Perhaps but I prefer a single over a 2+1. More drawn out turns and a cleaner feeling trim line. More limited in turn angles and generating (it’s own) speed. But for me that’s the appeal. It’s stripped back and basic, but you have to be spot on with everything you do. No room for error. Looks like it'd paddle well, Iggy. The fin box in my 6”10 was coming loose in the board so got a new one fitted. No bolt, just insert the fin and push into place. Dropped the fin size down to a new 7’0 and now set it up as a 2+1, which might give it a bit more range in different waves, for frequent short arc turns, rather than just drawn out swooping carves down the line. I like the sound of that finbox, what's the board? Here the way the fin box works.. The board is a mark rabbidge single fin step up. Have had it for a couple of years. Bought cheap off gummie. 6”10 x 20” x 2 5/8”. easy to do and invaluable in midlenghtns and bonzers. FYI sideways have a range of Phil Myers free flight channels. Made in indo thus cheaper.